Amrubicin hydrochloride is the hydrochloride salt of a third-generation synthetic 9-amino-anthracycline with antineoplastic activity. Amrubicin intercalates into DNA and inhibits the activity of topoisomerase II, resulting in inhibition of DNA replication, and RNA and protein synthesis, followed by cell growth inhibition and cell death. 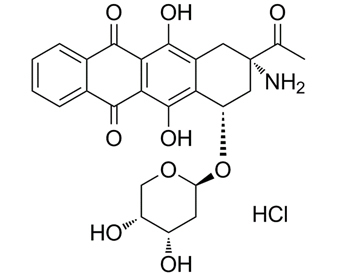 This agent has demonstrated a higher level of anti-tumor activity than conventional anthracycline drugs without exhibiting any indication of the cumulative cardiac toxicity common to this class of compounds.
. Hayashi S, et al. Enhancement of radiosensitivity by topoisomerase II inhibitor, amrubicin and amrubicinol, in human lung adenocarcinoma A549 cells and kinetics of apoptosis and necrosis induction. Int J Mol Med. 2006 Nov;18(5):909-15.
. Hanada M, et al. Amrubicin, a novel 9-aminoanthracycline, enhances the antitumor activity of chemotherapeutic agents against human cancer cells in vitro and in vivo. Cancer Sci. 2007 Mar;98(3):447-54.